Naturally, when I heard the words Stunt Woman and Speed Racer when perusing the New York Times Obituary section, I said Whoa Nelie! What's that All about? And making me even more curious was the article's beginning, on a Dry Lake Bed in the Alvord Desert in Oregon; Huh? This Brazen Femme fatale tapped the "Loud Pedal" twice before rocketing into the distance in a Blur aboard the SMI Motivator; Say What? The woman at the controls of this three wheel Rocket Car was Kitty O'Neil, who'd set the Land Speed Record for Females in December, 1976. Yet making Kitty's Daring Feat even more remarkable, was Hurtling to an Uber Stout velocity of 618mph-plus on her first pass, before shrieking back on her second flying Kilometer run to record a two-way average of 512.710mph - is the fact that she was Deaf! As Kitty's record as the Fastest Woman still stands some 42 years later! Kitty first hoped to become an Olympic platform Diver for the 1964 Tokyo Summer Olympics, but was sidelined with a broken wrist, along with suffering from Spinal Meningitis. before deciding she wasn't interested in Diving anymore, as it wasn't Scary enough for Her! As Kitty's "Need for Speed" began by racing motorcycles, where she met fellow motorcycle racer and future partner Ronald "Duffy" Hambleton, who was a Stuntman working for Stunts Unlimited. After Hambleton spent two years teaching her the tricks of the trade, and how to protect herself, Kitty was ready to become a professional Stunt Woman. Kitty quickly landed work on two Hit 1970's TV Shows, where she Stunt double for such leading Ladies as Lindsay Wagner, flipping a Dune Buggy in The Bionic Woman. And Linda Carter, jumping then a record 127-feet in a Super Woman episode; aye Karumba! Kitty also worked on other television shows like Quincy and Beretta, along with working in such movies as Airport 77, The Blues Brothers, Omen II and Smokey and The Bandit II to name a few work projects before retiring in 1982. But apparently racing motorcycles wasn't fast enough for this Dare Devil, who ultimately held 22 land & water Speed Records, including water skiing at 275mph! While O'Neil ultimately gravitated towards Rocket Powered vehicles, with her zenith coming aboard the SMI Motivator, for which I'd never heard of before. 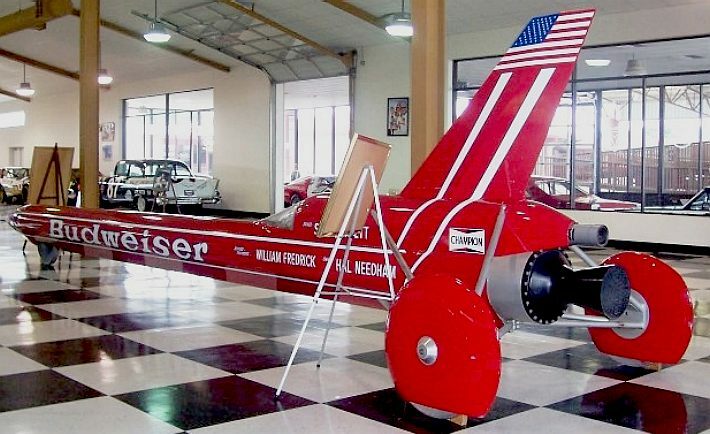 This Hydrogen peroxide propelled Rocket Car was owned by the legendary Stunt Director Hal Needham, for which Y'all might have heard of him? Can Yuhs Say Smokey and The Bandit? While O'Neil had connections to Needham, who's Stunt Company was named Yuhs Guessed It! The aforementioned Stunts Unlimited, for which Kitty was the first female member. Unfortunately, she wasn't allowed to keep Wonder Woman's lasso, which would have come in handy during her Land Speed Record attempt. As Needham had signed her to a contract allowing her to only utilize 60% throttle power for only breaking the women's Land Speed record. As Needham wanted the glory of breaking the overall Land Speed Record All to himself! "On each of her practice runs, O'Neil pushed the car up to speed with ease, and when she officially broke the record, she was still only using 60 percent of the Motivator's power. "There is no doubt," Sports Illustrated reported, "that by dialing in more power...Kitty would have gone still faster"--past the overall land-speed record (638.388 mph, set by Californian Gary Gabelich in 1970) and maybe even past the sonic barrier. But dialing in more power was not an option for O'Neil: under her contract, she was only permitted to drive the "Motivator" to a new women's record. The movie director Hal Needham had paid $25,000 for the chance to steer the car to a new overall world record, and he was determined not to lose that chance to a woman. So, after O'Neil set her record, Needham rather unceremoniously demanded that she be pulled from the drivers' seat. (His spokesman even told reporters that it would be "degrading" for a woman to hold the "man's" record.) While the lawyers squabbled, it began to snow, and Alvord was closed for the season. Needham never even got behind the wheel." As John Radewagen, a Chicago PR Man representing Needham and the Gabriel Toy Company that was preparing to launch Hal Needham Action Figure toys, claims he was falsely quoted over the Sexist remarks, albeit the Needham toys were "Pulled!" While Kitty would have her own action figure Doll marketed by Mattel. Along with a television movie about her life called Silent Victory, The Kitty O'Neil story starring Stockard Channing produced. Then further muddying thee waters, reportedly the SMI Motivator was severely damaged and a second Motivator built, before Hollywood Stuntman and latter 'RASSCAR "bomber" pilot Stan Barrett controversially broke the Sound Barrier in '79 aboard Needham's newest three wheeler incarnation, the Budweiser Rocket, a direct descendant of the SMI Motivator.